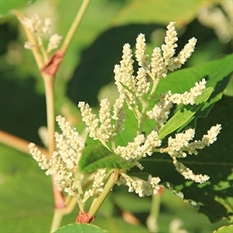 Two non-native invasive plants that have been gaining a foothold in recent years in Northern Michigan are Japanese Knotweed (Fallopia japonica) and Giant Knotweed(Fallopia sachalinensi). Both invasive species were introduced from Asia as ornamental plants. Several characteristics make these two perennial, herbaceous shrubs easy to identify including height and their hollow stalks, which persist through winter and resemble bamboo. Knotweeds are semi-shade tolerant but grow best in full sun and can be found along roadsides, stream and river banks, wetlands, wet depressions and woodland edges. The species’ deep tap­root and extensive network of rhizomes (they can extend laterally 23-65 ft.!) enable them to form dense monocultures and crowd out native plant species. Knotweeds can also sprout from fragments of root and stem material, which are oftentimes dispersed by water and equipment. They are most aggres­sive on sites with natural or human disturbance, such as roadsides and construction sites, as well as stream and riverbanks. It isn’t unusual for the rhizomes and shoots to penetrate asphalt and cracks in concrete! Both species’ deep tap­root and extensive network of rhizomes that can extend laterally 23-65 feet and can penetrate asphalt and cracks in concrete. Japanese knotweed grows 3-10 feet tall. 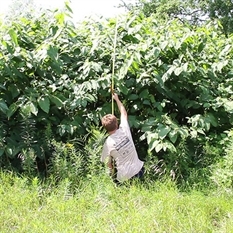 Giant knotweed can grow up to 13 feet. Unfortunately, controlling knotweed is no small task even with herbicides. Following the recommended treatment protocol for the species is strongly advised because improper treatment may lead to the further spread of the plant. According to the Michigan Department of Natural Resources (MDNR) and the Michigan Natural Features Inventory (MNFI), certain herbicides have been found to be more effective than others, whereas hand pulling, digging, mowing, and burning are considered ineffective and may even be counterproductive. Taking action to control the plant sooner rather than later is key. 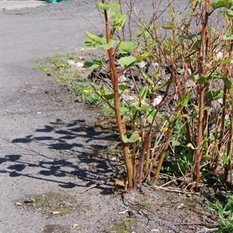 Mechanical methods alone will not effectively control large Japanese knotweed populations and may make them worse. 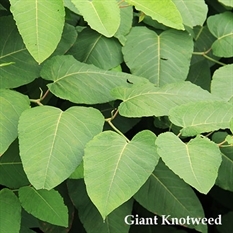 Control efforts must target knotweed’s massive underground system of rhizomes. This network allows it to spread to new areas even as it is being attacked mechanically. To date, a combination of chemical and mechanical techniques, in conjunction with on-going monitoring, provides the most effective control of this species. Knotweed rhizomes that have not been completely killed off may send up new shoots as many as three years later. In all cases, monitoring and follow-up treatment will be required for four to ten years, depending on the size and age of the population being treated. Remember that anyone using herbicides in the course of their employment is required to be a certified pesticide applicator.Treatment in wetlands or over open water requires a permit from the Michigan Department of Environmental Quality. 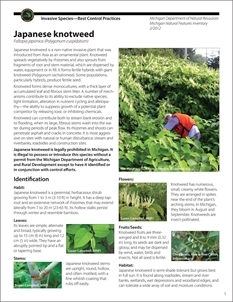 This fact sheet is an excellent resources for anyone that has a stand of knotweed on their property. It offers information for identifying plants and control and treatment options. 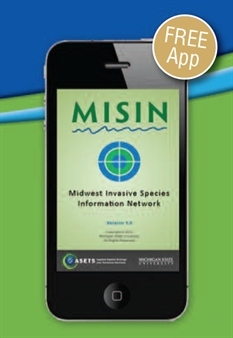 The MISIN smartphone app provides a mobile solution for the capture of invasive species field observation data. You can play an important role in the early detection and rapid response to new invasive threats in your area by contributing invasive species observations to the MISIN database. This short video, produced by Tip of the Mitt Watershed Council, will provide you with a closer look at invasive knotweed.